Plans to field a single opposition candidate in DR Congo’s presidential elections floundered on Monday, just weeks before polling day, after two major parties walked away from the deal under grassroots pressure. A day after he joined other opposition leaders in naming a little-known MP as their joint candidate, Felix Tshisekedi, head of the Union for Democracy and Social Progress (UDPS), reversed course. “I gather that the agreement reached in Geneva was not accepted by the grassroots and was rejected by them,” he said in an interview with the radio station Top Congo. “As a result, I am withdrawing my signature from this agreement, which we signed yesterday,” he said. Vital Kamerhe, head of a smaller opposition party called the UNC, followed suit. 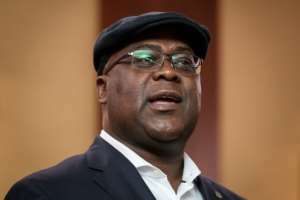 Tshisekedi spoke shortly after UDPS secretary general Jean-Marc Kabund said party members had angrily rejected his decision and gave him 48 hours to backtrack. The December 23 elections — which are also unfolding at legislative and municipal level — are a watershed for the Democratic Republic of Congo (DRC). Mired in poverty and troubled by conflicts in two regions, the mineral-rich country has not known a peaceful transition of power since it gained independence from Belgium in 1960. Since 2001, it has been ruled by President Joseph Kabila, whose regime has been widely criticised for corruption, incompetence and human rights abuses. Kabila, 47, is unable to seek a new term in office because of constitutional limits, but has handpicked his party’s candidate — Emmanuel Ramazani Shadary, a loyalist and hardline former interior minister. It was to boost their chances of winning that the divided opposition sought to choose a unity candidate. Late Sunday, they announced the choice of Martin Fayulu, whose party has just a small handful of MPs and far less national recognition than Tshisekedi. It came as a shock to many in the UDPS, the country’s oldest and biggest opposition party. Just eight months earlier, Tshisekedi, 55, had been massively approved as the party’s leader and election candidate after the death of his popular father, Etienne Tshisekedi, who co-founded the party in 1982. Demonstrators gathered in pouring rain on Monday to express discontent outside party headquarters in Kinshasa, burning effigies and pictures of Felix Tshisekedi, police spokesman Pierrot Mwanamputu told AFP. Witnesses also reported seeing them burning tyres. A similar protest took place outside the offices of Kamerhe’s Union for the Congolese Nation, or UNC. Tshisekedi was defensive about his decision to back Fayulu. “If I went to Geneva, it was with the approval of the grassroots,” he said. Under Sunday’s agreement, Fayulu would run at the head of a new opposition coalition called “Lamuka,” which means “wake up” in both Lingala and Swahili. But the future of the accord is now uncertain. Tshisekedi, who has yet to return to Kinshasa, did not say whether he intended to maintain his own candidacy for the elections. His chances at the Geneva meeting may have been boosted by a storm over the planned use of South Korean-made electronic voting machines. The authorities insist the technology will cut costs, prevent fraud and provide a faster tally, but critics claim they could be used to rig the election. Fayulu threatened to quit the race if the devices are introduced for the vote, while Tshisekedi said he would run whether the machines are used or not.